The White House says taxes on the average family would increase by $1,000 if the cuts are not extended. WASHINGTON — President Barack Obama pressured Republicans in Congress today to extend a payroll tax cut, saying the economic recovery is “still fragile” and middle class families need the money. “My message to Congress is this: Keep your word to the American people and don’t raise taxes on them right now. Now’s not the time to slam on the brakes. 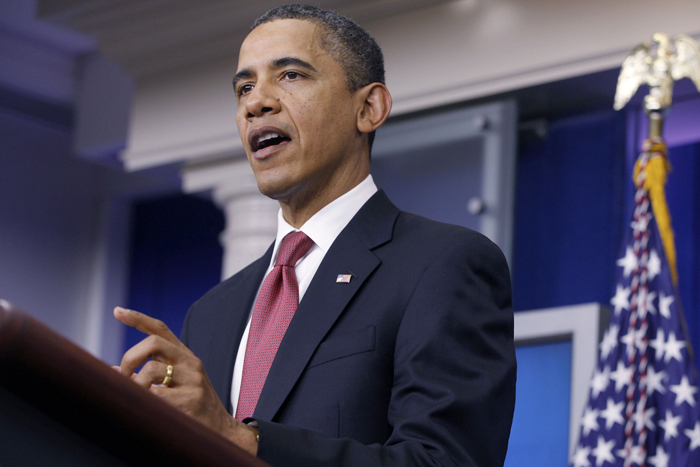 Now’s the time to step on the gas,” Obama said at the White House. He said despite a decline in the unemployment rate to 8.6 percent in November, “our recovery is still fragile” and the nation’s economy could be hurt by economic turbulence in Europe. The president has been seeking an extension and expansion to the payroll tax cut that will expire at the end of the year. The White House says taxes on the average family would increase by $1,000 if the cuts are not extended. Senate Democrats have rolled out a compromise that would drop Obama’s proposal to award the tax cut to employers, bringing the cost of the plan down. The White House has called for an extension of benefits that can cover up to 99 weeks for the long-term jobless. State unemployment insurance programs guarantees coverage for six months, but Congress approved additional benefits in 2008. Expiration of those payments would mean an average loss of nearly $300 in weekly income for more than 1 million households in January.